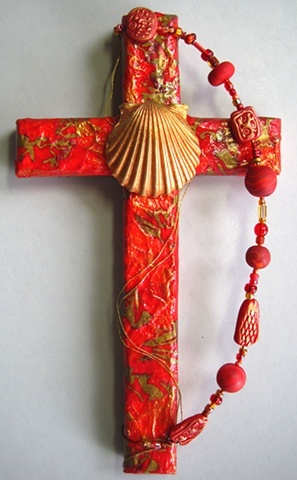 The scallop shell embellishment on this cross symbolizes baptism and our baptismal covenant; "I Will With God's Help". The wood cross has been covered in a collage of fancy papers and fibers by Patti Reed. I made the scallop shell of polymer clay from one of my impression molds of an actual seashell I collected from the beach. The swirling of handmade polymer clay beads on the wire remind us of the presence of the Holy Spirit that flows through all that we are and do as Christians.